When you need a large non-stick griddle for your cooking needs, look no further than the BroilKing Professional Griddle. This professional griddle boasts a large, heavy-cast cooking surface that's 21" x 12", more than enough to cook a variety of delectable foods at once. The high-tech charcoal gray surface stays a consistent temperature and cooks food evenly across the entire griddle. Cool-touch stainless steel handles provide a grip to get some leverage while cooking. The best part is just how impressed and stuffed your family and friends will be after your meal. 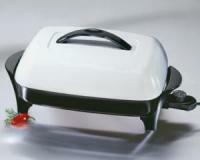 But the worst part of any meal is the clean-up--unless you're using the PCG-10 griddle. A removable stainless steel backsplash doubles as a splatter guard for effortless cleaning. 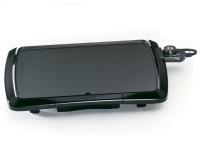 Its non-stick surface prevents grease and food from getting stuck to the large surface. And this griddle doesn't flinch at making perfectly crisped bacon. The griddle's back legs flip down to create a ramp for the grease to flow down. It doesn't get much better than that. • Large, heavy cast cooking area: 21" x 12"
It is well designed, produces excellent results and is easy to use and clean. The back splash is a great addition. Cooking on the griddle is great! 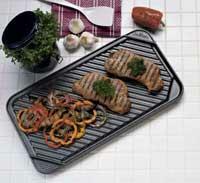 The nonstick surface works beautifully and appears to be very durable, and the heat is good and even. We love it and use it just about every day. We'll even use it plenty when grilling season comes back. There's always something that can go on a flattop. For years I have struggled to make good pancakes (like they do at Denny's)but never succeeded. With the Broil king Professional Non-stick Griddle I have now, on several occasions, made perfect pancakes. The heat element is well controlled and the surface is even as far as heat is concerned. I have recommended the unit to my children! I love it! We use it twice a week for pancakes and bacon breakfasts! This is a high quality product, but as many others have said, the heat is not perfectly even. But it still does a great job. I have already used it for pancakes, french toast, quesadillas, grilled cheese, and eggs. So far, so good. 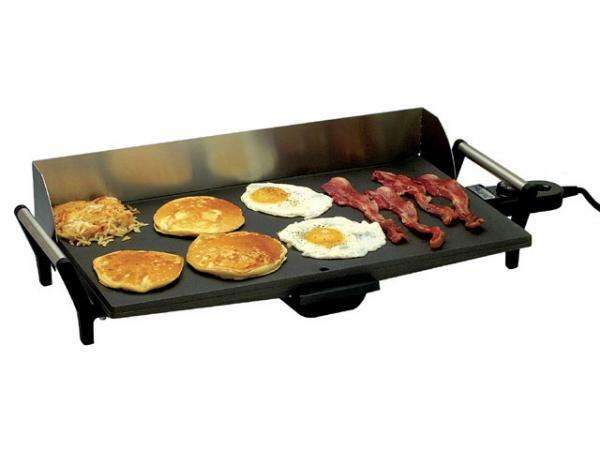 This griddle is of good quality and works well! My one disappointment is that the non-stick surface does not brown pancakes as much as I would like. It does do a decent job with pancakes, just not as browned as a plain metal surface.